I hope you had a wonderful Thanksgiving (or just a really nice Thursday, if you’re elsewhere). We slept in, roasted vegetables, and wrapped up our evening around a bonfire by the river bank. This weekend is looking to be cozy and full of friends, as well. Nota bene: Friday Favorites posts contain a few affiliate links. I will receive a small commission for any sales made through the use of those links below. Thank you! Alternative Apparel is offering 40% off sitewide, plus free standard shipping. Use the code BLKFRIDAY. Ends Sunday. The Backpacker cardigan sweater looks warm and snuggly. All orders over $125 at True & Co. will receive 15% off and free shipping with the code BLACK15. I love the Secret Garden set. Of all the holiday offerings from Julep, I love this duo of Becky and Logan the best. On sale for $7.99 until 11:59 PM PST Saturday. This is a great deal. I would snag it if you love nail polish like I do. These Are Things has some awesome lapel pins. Receive 20% off your order until 11:59 PM EST on Monday with the code HOLIDAY20. More pins! The scarlet rose pin is back in stock at Inner Decay, along with some new designs. The ecstasy of Saint Teresa pin remains a favorite. Get 15% off your order today using the code FRIDAYDECAY. Lots of new items and old favorites are on sale up to 40% off at ModCloth. The Diagonal Alley coat is on sale for $97.99. If I didn’t already have a handful of winter coats in my possession, I’d probably go for this one. 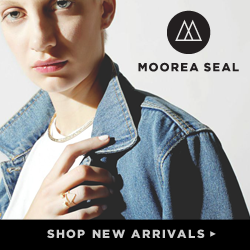 It’s up to 70% off at Moorea Seal! I am normally a wire earring kind of girl, but I love these kyanite and pyrite studs! I would never think to pair these two stones together, but it’s doing something for me. So help me, I’m going through another comics phase. I’ve decided that I am now old enough to no longer be even remotely embarrassed. Nimona keeps popping up, so it’s officially on my Yuletide wishlist. Noelle Stevenson seems like a girl I’d like to be friends with. I am dying over these Viking Axe leggings from Sovrin. I’ve featured Kayla’s work before in a Friday Favorites post, I am sure. Through Monday, you will receive 10% off your order of $20 or more, plus a free surprise mini patch using the code GOODKARMA. 10% of all shop sales (before discount) will be donated to a local Wisconsin farm animal rescue shelter. Shop on etsy.